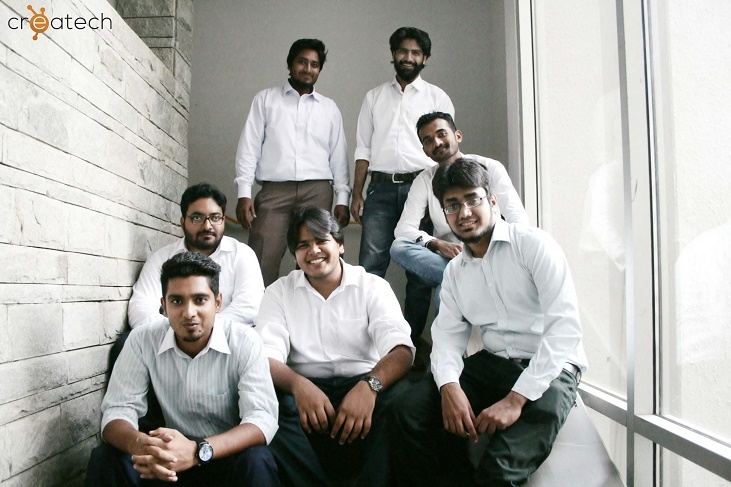 TechJuice > Startups > How a young Pakistani startup got several local and intl. clients within a year of operation? Lately, we have been seeing a number of software houses and digital media agencies entering into the lucrative software market of Pakistan. Either they fail to succumb to the pressure or emerge as a successful entity. In such competitive market, Createch promised not to be just another software house; therefore, they proved within a year that what they are offering to the local market of small and medium-sized enterprises (SMEs) is unmatched. When we heard two business students have started this successful tech venture, we knew they will have a great tale to tell. How Createch is helping other SMEs? How have they expanded from a desk to a complete office? You can get all these answers with our question answer session with Mahmood Ali, Co-Founder of Createch. How did the journey of Createch start? How do you differ from the mainstream software houses? Me and my friend Ali were business students and we were doing some freelance work for a while. When our graduation was around the corner, we were still figuring out whether we should opt for a job or start something of our own. We clearly did not want to start up another software house or add to the pool of digital marketing agencies. None of us hailed from technology background so we started learning about open source development. We thought this way we can start a cycle and our learning curve increased exponentially. Here, we identified the market gap between tech people and business people. Businessmen only need solutions for effective business management and the developers were using technology to develop such solutions but not in the right way. They will usually propose something that a naive business person was unable to understand. In addition to that, a lot of small conventional businesses use Excel sheets or even record on paper. The reason is that the popular ERPs and CRMs are expensive to deploy and operate; therefore small businesses were unable to opt for them for their business optimization. We also identified that a lot of SMEs have no idea about PayPal and how international transactions could work. We initiated Createch at IBA Center for Entrepreneurial Development (CED) with a little initial capital we had earned through freelancing. We reached our first milestone on 8th August 2014 initiating our venture. The next month we were exhibiting at ITCN Asia that provided us a great boost. We secured our first international and local clients through that exhibition. It came as a surprise how clients were opting for a company that has not even completed a month. We believe it happened because we asked them what solutions are you looking for business optimization instead of what systems do you need? Here, we remembered the problem statements that we had identified and we started working on their solutions. Firstly, we came up with local transaction support for international businesses. We deployed Google2Checkout, PayPal and other online payment gateways so our local businesses can dwell into international markets. This also provided a chance for various e-commerce ventures that were only using the COD model and EasyPaisa for their transactions. We also developed the very first COD Portal for Stallion Deliveries which broke through the market of CoD while competing with Leopords’ Courier and TCS. We provide enterprise solutions including CRM, HR Management, Inventory Management and Point of Sale Systems. In addition to that we have been developing e-commerce solutions & web development for our clients. We also provide brand management and digital marketing solutions. Our international clients include: Digital Link INC, Lexus of Seattle, Fly Sasta, Gulf Gold, Platinum Bay, Freij Entertainment and many others. We have also been providing local support to IBA, Tripda Pakistan, Ginsoy, Califord, Ignite Pakistan, MAQ International and noticeable NGO’s like Karachi Down Syndrome, DarulSukun, Ahsan Trust , CSR Association of Pakistan and various others. How Createch is helping out other SMEs with smart business solutions? Our main aim is to provide solutions for small to medium enterprises. We charge very nominal, around Rs. 1000 for our cloud-based point of sale product, per user per month. Similarly, we can set up Facebook store for our clients for as low as Rs. 3000. We charge the same for setting up CRMs. A lot of our products are using the SAAS model. You see, this is very nominal for small businesses and if they want customized products, the costs may vary, but the solution will be according to their needs. You have been working on GroupBuy.pk, what are you aiming at with this product? We wanted to introduce the group buying culture in Pakistan. We tried our hands on two websites dealmonster.pk and etailmonster.com, but we failed. We had been working on Group Buy.pk for four months. Once after we gained the experience and knowledge about the industry and e-commerce market from our past experiences we improvised our strategy and launched this venture. The recent milestone that we have achieved is that our individual buyers have soared to the number of 15,000 + and we have established our reach by 100,000. When we started off, we were getting 25 – 30 orders per month, but the progress is promising and now we are processing above 150 + orders a month. We are also getting offers from local and international investors, but we have not taken a decision yet. From individual buying, we will soon be moving onto group buying where our users can buy in a community. What challenges did you face when you initiated Createch? We did not have any significant capital to invest in our venture. All we had were some savings from our freelancing days. For our first project, we invested all of it and we did not have a single penny even to pay for the rent of CED. Moreover, all our batch mates were getting hired by big corporations. You see I had served as an internee in Unilever, Meezan Bank and ShaukatKhanum Memorial Hospital so even I was getting lucrative job offers and my partner Ali was US Exchange Alumni. Refusing these offers and holding on to our venture when there was no capital was the biggest challenge we faced in our journey. How did IBA’s Center for Entrepreneurial Development facilitated your start up? In the initial phases CED arranged a work desk for us at a very nominal rent per month, which after a year grew into a complete office. The biggest vantage that CED provided was the strong network of IBA with industry professionals and also the market advantage that an IBA graduate gets. CED helped us out whenever we were in a need of advice; they also got us mentors from the industries. While supporting our business, they facilitated us not only with mentorship but also helped us with local and international sponsorship. We started with two people at a desk and now we have expanded to an office of 13 people out of which 80% are permanent employees while others are internees. We are still resided in a suite at the CED building. Don’t you think service providing is holding us back from developing local products of our own? The main reason for this is that we all have short-term mindset, while development of products requires long-term thinking. It is not just services that we are providing, but we have also made some CRM, SME and e-commerce products that are working on the SAAS model. Moreover, we know the point of sale software is usually desktop based, however, we have made this on cloud-based platform and launched it as a product. This product is same for everyone, however if a client needs customization than the cost will vary with the features. We have recently acquired the status of Pvt. Ltd. and we are looking forward to setting up our franchise. For this purpose we have planned to inaugurate offshore offices in UAE & USA by the end of this year. And we actively pursuing partnerships locally and internationally.